SORRY NOW SOLD. MORE REQUIRED. JUST 5,000 MILES FROM NEW & 1 P/OWNER. Must be the lowest mileage example available today. Very rare 6-speed manual model finished in unmarked Titanium Silver Metallic with full Cream Beige Dakota leather. Specification includes electric heated sports seats with additional electric lumbar supports + driver memory settings, M Sport multi function steering wheel, BMW 6 CD auto changer, climate control, cruise control, on-board computer, ISOFIX child seat system, dark grey Poplar wood interior trim, auto-dimming rear view mirror, electric folding mirrors, rain sensor with auto headlight activation, rear parking sensors, totally unmarked 19″ M double spoke alloys with matching Bridgestone Potenza tyres, fitted BMW carpet mats etc. 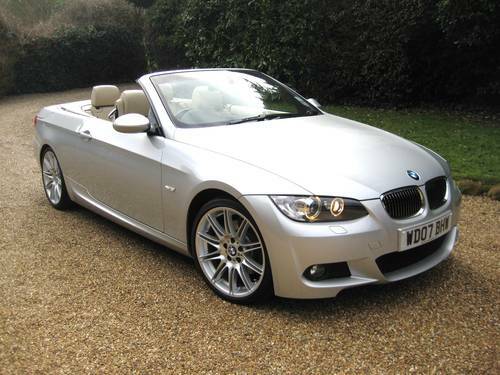 Supplied new & fully serviced by Westerly Barnstable BMW in Devon. Last serviced at 4658 Miles in 2015. Next service due in 14,000 miles Or 2017. Complete with new 12 month MOT, owners book pack + both remote keys. THIS IS AN ABSOLUTELY STUNNING LOOKING ULTRA LOW MILEAGE EXAMPLE IN TOTALLY UNMARKED CONDITION THROUGHOUT.